Happy May everyone and welcome to our latest Collector Limelight blog post. This month we head to a part of the country that has seen some of the worst weather in years. Luckily for them, the absolute worst hit a few hundred miles North in Boston, but still, NYC has had a very harsh winter, and thus I was happy to spend some time in February with Yehuda Kleinman, who probably needed a bit of break from the inhospitable climate. Yehuda is a lifelong collector. Growing up in the 70s and early 80s gave him the benefit of being the perfect age at the perfect time to experience the Star Wars phenomenon. As a Brooklyn and Manhattan native, he was also in a unique position geographically as a child given the unique aspects New York City retail stores at the time period. Unlike the suburban big box mentality that had already taken over with the likes of Wal-Mart, K-Mart, and Target in its infancy, Yehuda picked up his pieces at department stores, drug stores, and hardware stores, as these were the primary outlets for these types of products at this time in NYC. For Yehuda, this is really his first limelight, or public showing of his display in general. Unlike the other collectors I’ve covered to date, this collection isn’t seen on social media, forums or other venues. Thus, I was very excited that he would allow me to cover his vast collection of Star Wars and other toy lines. Residing today in Queens, Yehuda has a particular style in how and what he collects, making the collection we are about to see unique unto itself. When Yehuda told me during the interview, “I collect a lot like Gus and Duncan,” at first I thought that meant that his house was overrun with multiple rooms of Star Wars memorabilia, but what it really meant is that he’s not a completist and has a sampling of something from each segment of the release. This lead to a lot of discussion as there are dozens of segments of his collection to cover, spanning all three movies, multiple foreign release, production, pre-production, and other toy lines worthy of mentioning here. Yehuda and I had the first multi-part interview since I started this series, somewhat based on the depth of his collection, but also based on the fact that he’s just that personable of an individual and made ample time for us to chat which also leads to the longest post I’ve put up to date. I hope you enjoy the interview and dialogue he provided as much as I enjoyed discussing his collection. When we first conversed I wanted to spend some time on what segments of collecting he focuses on. Here I found that one of the greatest things about his collection is the variety. Not only does he have a complete run of MOC figures, he dabbles in everything. A 2-pack here, a 3-pack there, a 12” run, lots of vehicles, several large proofs, the coin series complete with several prototypes, and to top it off a run of Raiders of the Lost Ark figures and the 18” Alien figure -- literally a Kenner menagerie of items. 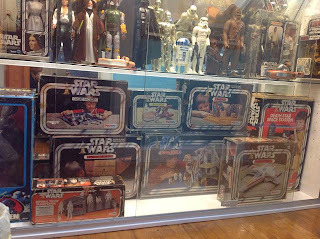 Of all these niches in his collection, the one area that I felt he connected with the most and stood out for me was the Palitoy series. It’s well represented through and through and one of the most impressive areas of the collection overall. Thus when we started the discussion I wanted to dive right into Palitoy and what it meant to him in the grand scheme of his collection. YK: Started to collect loose, then carded, didn’t really focus on collecting full sets, but rather what I wanted in each segment. I ended up getting a full run of loose, then carded and coins as well, but it wasn’t the real goal for me. YK: The first movie came out when I was 4, so I saw Star Wars in the theater. I was in a store a year later when the figures first came out. 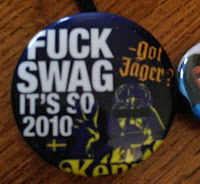 I was totally at the right age. 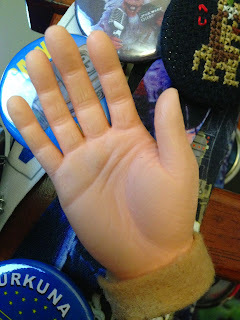 I remember sitting at recess playing with the figure reenacting the movies, and it stuck with me for all my primary years (1st grade, 2nd and onward). I stuck with it through high school and ended up acquiring a lot of my friends' collections. It started building into armies -- Stormtroopers, Jawas, Death Squad Commanders, and even Vaders. I started to get interested in what else what out there, stuff that I didn’t have as a kid. YK: In the early 90s when I went to shows, there were always a few Darth Vader cases. Sometimes you would even see a carded figure. I went from collecting individual figures to collecting a full set of figures, mixing carded figures I would find with loose figures and forming a set of them that way. 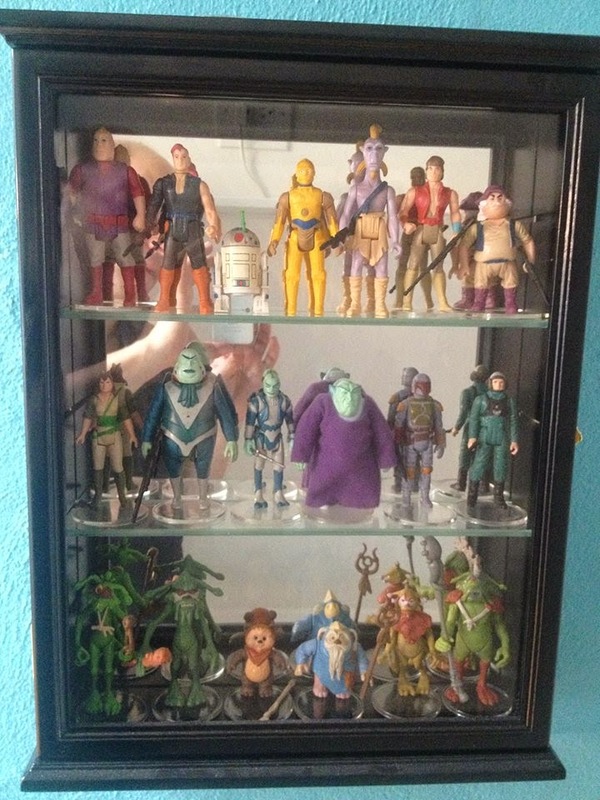 When I started building my display, it didn’t look right to have the carded figures in there with the loose figures. Even though they were beaters I couldn’t bring myself to open them, so I ended up trying to buy the rest of the figures loose. I went onto buying mailers and the coins. 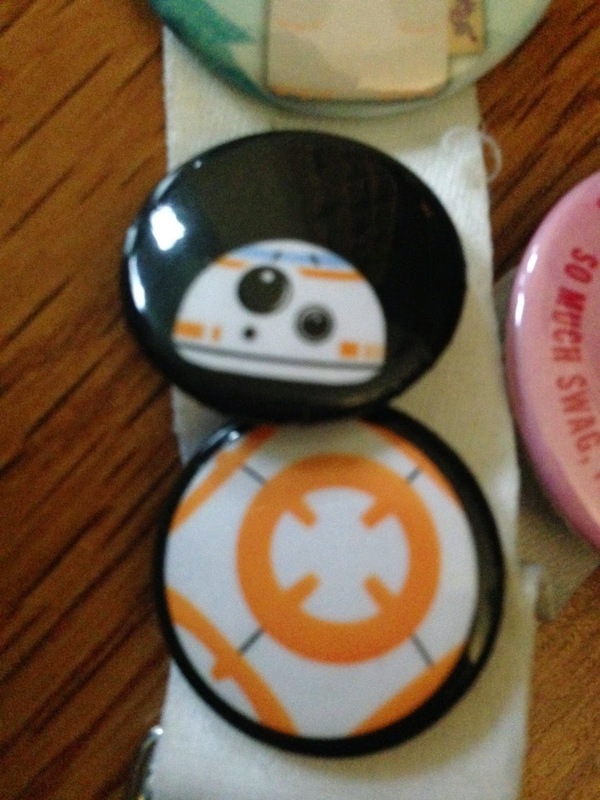 It was the infancy of Rebelscum at that point, and the Archive. FP: How have you gone about putting your collection together, what was your approach? YK: I collect a lot like Gus and Duncan -- I collect the things that interest me and don’t focus on completing sets. I have one 2-pack and one 3-pack and so on; I find if you go any further you can turn these into complete collections and focuses unto themselves. The collection itself is all just things that I enjoy. There are several areas that I have only one or two pieces of and that’s really my style. Years back I approached Tommy Garvey. He mentioned going to The Earth for a pre-production piece. 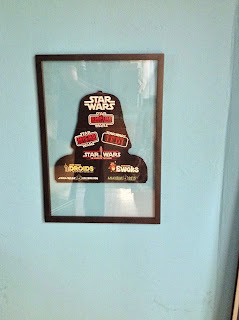 The first one I picked up was a Bondo head from the second series of the Ewoks. It started the pre-production collection. Stuff is hard to come by, so I just try and wait for the right pieces to come along and buy other stuff in between them. When you’re a focus collector stuff lines up easily in a display, where when you have a lot of stuff you have to find a way to make it harmonize. When I have things that are completely divergent from each other I try to use different levels or shelves, as it gives separation and shows each of the individual pieces a bit more. That way it’s less distracting to the eye. My rule with pre-production is to buy whatever comes across that I really like and not get too specific on whatever comes my way. There’s a sticker shock that comes to a lot of folks that have collected for a while. I was also picking up a lot of stuff that Todd Chamberlain was selling, Hershey pendants and Oral B tooth brushes. What’s nice is that this stuff has a lot fewer collectors going after it. FP: One of the first things I notice when I look at your collection is the displays. They’re quite unique can you tell me how you decided on that layout? YK: When we bought our house 7 years ago we looked at one part of the attic which was a lofted space, but as we continued working and renovating it went from being my closet to something else. A lot of my stuff was in boxes in closets, and wasn’t displayed. The house due to its shape wasn’t really set up great to do boxed cases like those from Ikea. So I decided to build the cabinets from the ground up. This way we could use the space the way we wanted. This helped us get almost everything out there. The walls angle upward halfway up due to the vault. I wanted to keep the architectural integrity of the house and building the cabinets was the best way to do this and make the best use of the space. YK: One piece that was more difficult to find room for was the Imperial Shuttle and I needed to build a specific space for it. Another was a mold that was very heavy for the AT-AT Driver; it was several hundred pounds so I needed to build a plywood shelf for it vs. the glass shelves I used in the majority of the display. It was a challenge to get it up to the attic, but it was well worth it. Although I have some cases for pre-production, I do mix things with production and pre-production. While putting it together I played with light and placement. I wanted every piece to be visible, while having the better pieces getting the majority of the focus (tough with 1000s of items). I went with a matte white background, as it makes the cabinet disappear. The lights are LEDs to help reduce any UV light. There are 7 windows and a sky light, so I had the windows tinted with a tint that eliminates the UV, and reduces the natural light. The packaging wasn’t made to be preserved -- it was meant to be thrown away. But if it’s preserved right it will last, but at the same point you don’t want to keep them in the dark. One random thing we did in the room as well was add a Switcheroo for the light switch for the cabinet, it adds another element of cohesiveness to the room. FP: How about protecting the figures -- do you grade them? YK: I don’t grade my figures. Where you see the cases it’s just sliding cases, I feel these are effective. FP: One set of figures in your collection that stands out to me are the Droids and Ewoks figures. 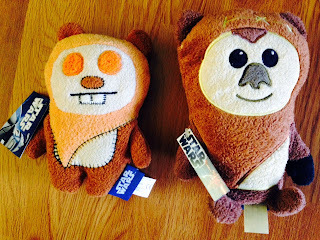 YK: I have the whole run, of Droids and Ewoks (including Vlix). It’s an old display, and I have moved them over time. It’s a fun display to have up as people who were not familiar with the series could see something different and unique. Vlix I got from a good friend who was looking to move the item as he wanted something else. He came without his weapon, but I eventually found one for him. If you’re patient things will come around; it’s a marathon not a sprint. If you collect the things you like it will probably become valuable as there will be others who feel the same way. If you collect because you think it will grow in value you usually won’t see things grow in value. When I look at the evolution of the hobby it’s very similar to comics. Golden Age wasn’t kept in nice condition and people didn’t collect them, people started to keep them in the Silver Age. Vintage toys are akin to the Golden Age of comics, and vintage prototypes are like Golden Age artwork. This is why the POTF2 line wasn’t appreciating in value. There seems to be similar patterns in other hobbies as well. I’m glad my mom didn’t throw out my toys like my grandma threw out my uncle's comic books. FP: If the circumstances called for it would you get rid of your collection? YK: If I had to get rid of it I wouldn’t think about it twice. It’s the friendships and memories that are the most important aspects of the hobby. My greatest enjoyment in the hobby is gaining knowledge and developing friendships. Another great thing that really made the hobby even more interesting was when I had children who enjoyed it as well. You get to relive it through their eyes. I even sat through the prequels a few times be-grudgingly. Really looking forward to seeing the new movie for the first time with the kids in the audience. YK: My hardcopy King Gorneesh parts. 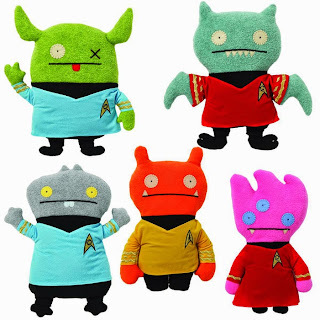 Such an interesting piece -- Mattias sold them to my wife who got them for my birthday. I don’t really own anything that’s complete that’s pre-production; I have the head, the comb from the top and the tail as well. I have a first shot of the figure without a head, so it fits well together. Over the years people made fun of me as I’m the parts collector. 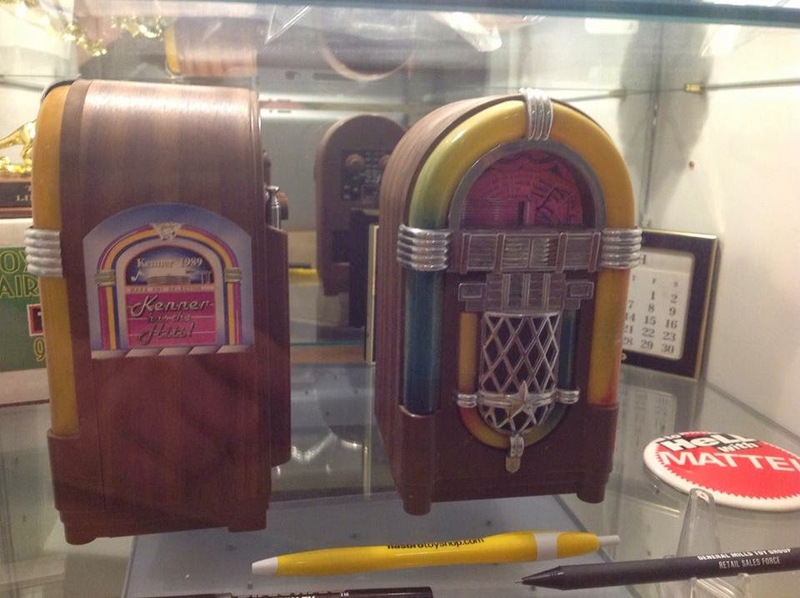 YK: Jukebox and radio restoration. SW is where I spend a lot of my time. A collector is a collector, so I always seem to find things I like. As a kid I collected toys and baseball cards. 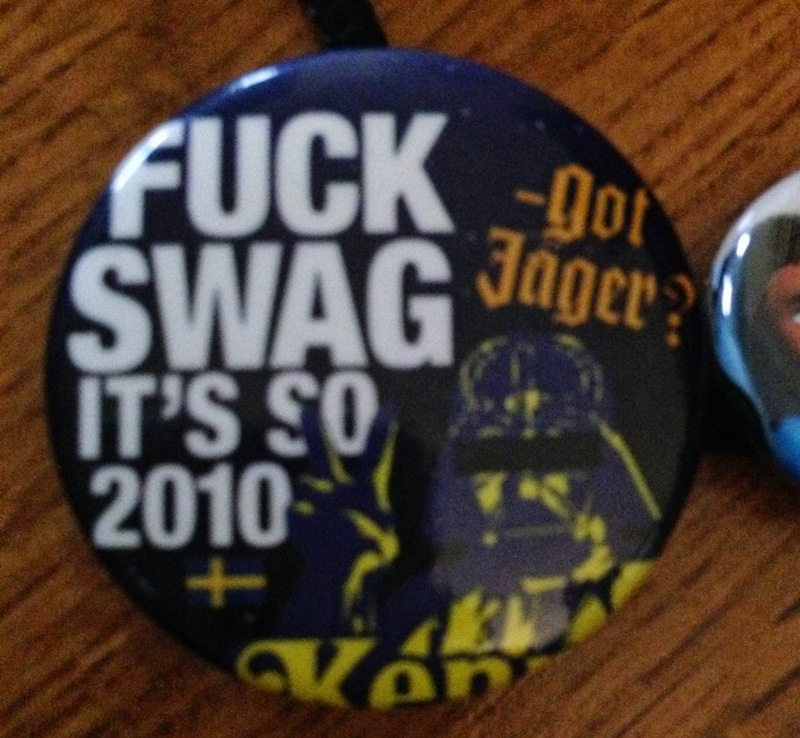 My wife collects antiques. Another piece worth mentioning is something Gus gave me. It’s shaped like a jukebox (an employee piece from around 1990) -- it’s a great tie in to both collections. It’s a radio, a jukebox, and its Kenner so it’s such a great cross over piece. I still have my childhood radio that is really similar in all ways except it doesn’t have a speaker. It's a kitschy piece of Americana. If you look on the Toy Fair catalog from 1990, it says "Kenner has the hits." FP: That’s really cool on the cross over. I’ve seen a lot of those jukeboxes like AMI and Seaburg come up on American Pickers and some of the other collector shows. FP: If I asked your significant other about your collection, what would she say? YK: I know exactly what she would say. 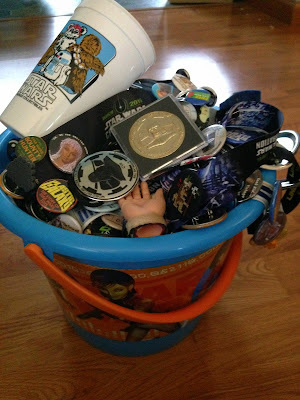 Although she doesn’t collect Star Wars, she understands it gives me joy and pleasure and that’s what is most important. She has her handbags, shoes, and antiques. When I designed the room she helped me with the colors and designs, and even pushed me further on investing into the displays than I originally had thought. 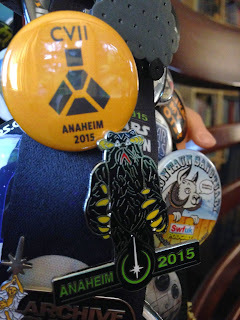 FP: What would you want others to know about your collection, or your experiences collecting? YK: It’s ah…it’s something that gives you many different levels of enjoyment, including reliving things from your childhood, watching your kids appreciate it, hanging out with friends who also appreciate, it’s a great escape. We all have work and families, so it’s a great way to relax and unwind. It’s important to pace yourself. You can burn yourself out or isolate yourself, so you need to maintain balance. YK: It’s a patch that a bunch of us put together for Celebration 7. It’s several pieces that create one large Darth Vader bust to resemble the Vader Case which several individuals decorated for Celebration 7. FP: Tell me about the coin collection. YK: Along with a lot of the stuff in my collection, I would see something I wanted and would acquire and then I would expand from there. With the coins I had all the Category 1 coins, and thought I would try Category 2. 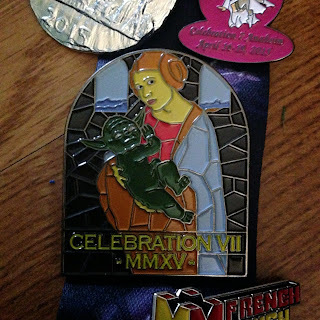 I found Anakin, Yoda, and a few others, and from there I decided to get all 62. 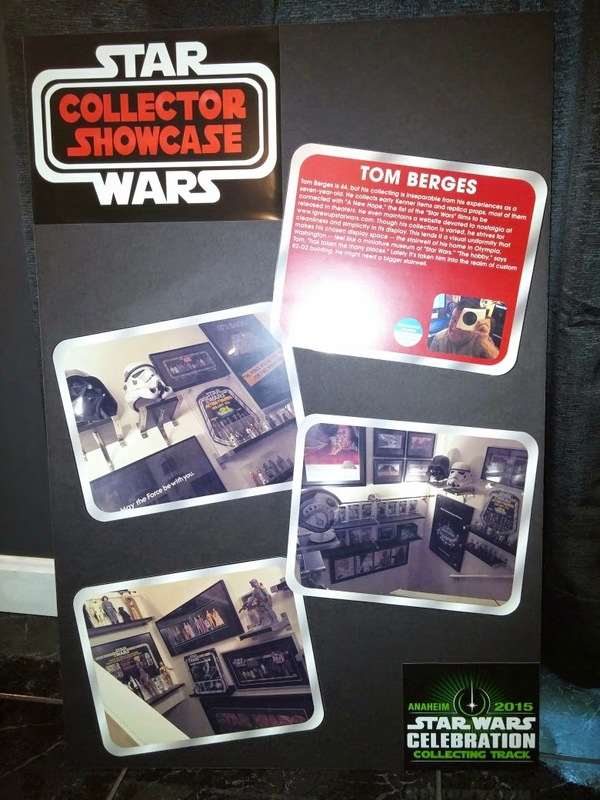 Tom Neiheisel (NEXTOY on eBay) -- he was the source of the AT-AT and Falcon proofs, along with a ton of toys (the AT-AT and Rebel Transport Proofs can be seen in a poster swing in one of the images). 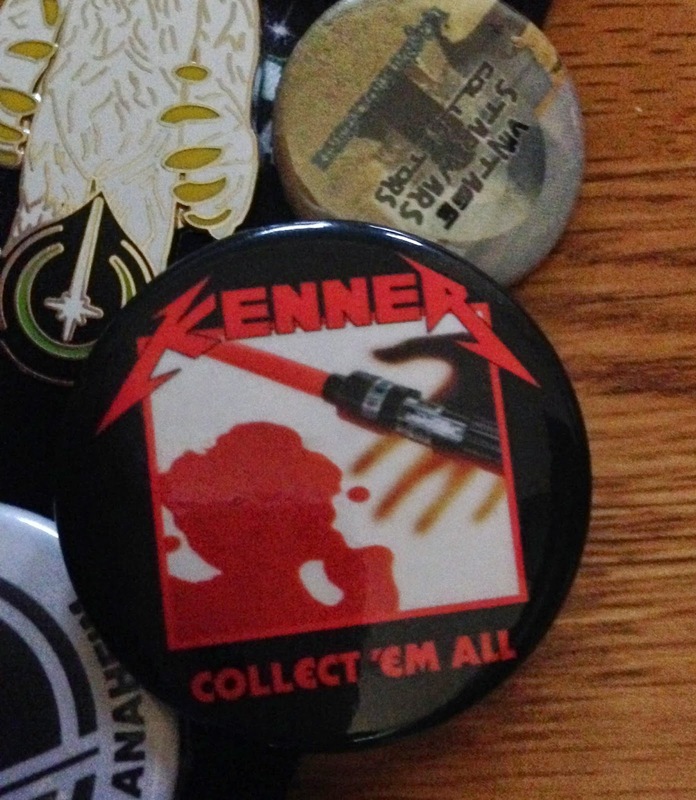 A lot of my coins came through Tom so it was directly from Kenner to Tom to me without any intermediary. 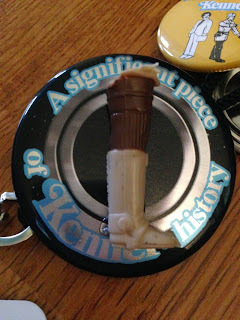 FP: Tell me about the Indiana Jones items -- how did that line end up working it’s way into your collection? YK: It’s still Star Wars stuff isn’t it? George Lucas, Harrison Ford. I remember picking them up in the stores, but if I had one choice for a toy I would get a Star Wars figure. I started to appreciate these more as an adult, as they mimic the Star Wars figures, with the card layout, the movie shots, and the mailaways. It became a natural progression for me as a collector. The figures had articulated knees, and arm swinging action with the German soldier. I have a fair amount of the run, including a hand-made styrene model of the truck and a bunch of proofs that I got from Tom Neiheisel. There’s a few holy grails in the line, including the mailaway Ceremonial Belloq as a carded figure and a few salesman samples. FP: Another Kenner offshoot I noticed in your collection is one of my favorite toys of all time, the 18” Xenomorph from Alien. Tell me more about that piece. YK: Politically the toy manufactures have to do things to make the other side of the business happy. The producers of the movie wanted to market the line to kids. Alien was done tongue in the cheek, they did the same marketing, and it didn’t do well. FP: I would be remiss not to bring up your Star Wars MOC collection. What can you tell me about those pieces? YK: I have a full offerless movie release set, (except 4-LOM), a decent set of variants, (Leia and Luke Bespin). I don’t have a lot of variants, as I focus a lot on international releases, things like a Harbert Vader, a Takara C-3PO -- I thought they would look nice with what I had. Glue Stick cards, one 3-pack, one 2-pack -- I just wanted representation of these as collecting all would be a hobby within the hobby. 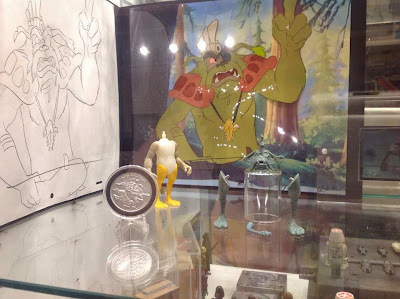 FP: I noticed a few POTF2 pieces in your collection -- prototypes from memory -- how did these additions come along? YK: I didn’t’ buy anything when it was in stores. All of a sudden over time, the figures had their own kitschy appeal; they’ve become their own things. I don’t collect production pieces as it becomes monotonous. I just collect pre-production. Because there’s a limited supply of pre-production it’s a nice fun hobby a little bit of an offshoot. A lot of the stuff that was made during this run was made by people who made items for the Vintage line. They're a way to keep the hobby going and extend it beyond the Vintage line. It refreshes your passion for collecting. Modern prototypes have become more of a new niche. It’s more attainable, and it was made in-house by some of the same people in Cincinnati as those that worked on the original line. The stuff that was created from 94-2001 before they left Cincinnati is selling for what Vintage pre-production stuff sold for 10+ years back. FP: Any regrets from your years of collecting? YK: The only regrets are things that I didn’t buy. Yehuda is the type of collector that everyone likes to chat with. His demeanor as an individual is approachable and genuinely open. 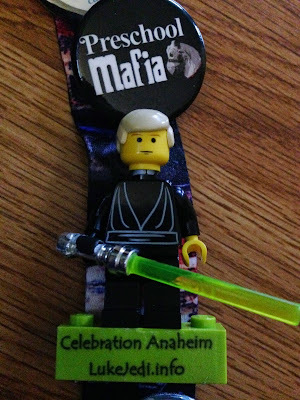 Before I finished this post I had the chance to meet him face to face at Celebration 7. I was excited to meet him as we had such a lengthy discussion, and it was the first time I had conversed with the subject of one of my Limelights in person. 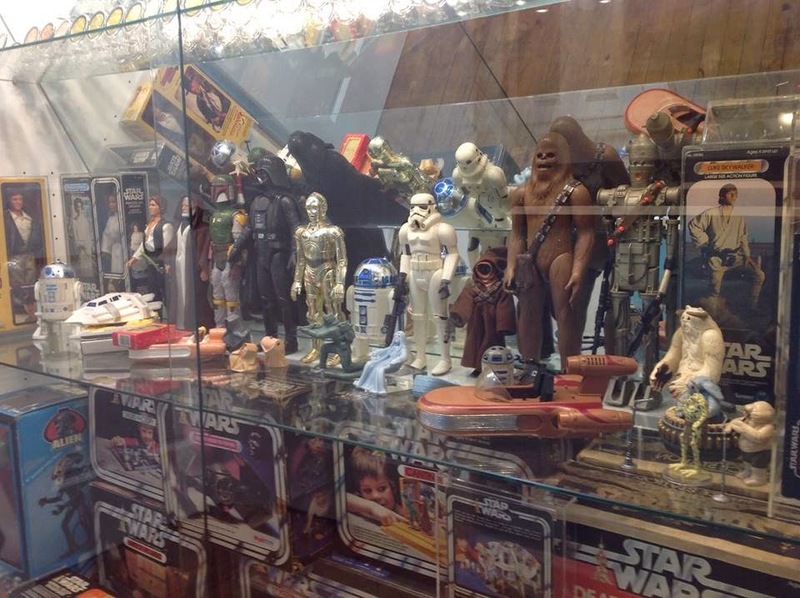 Looking through his collection there’s literally something for every Vintage collector. It was a great honor to get to cover his efforts and truly a pleasure to cap off this discussion with a face to face meeting. Yeah, we've been pretty quiet around here of late. 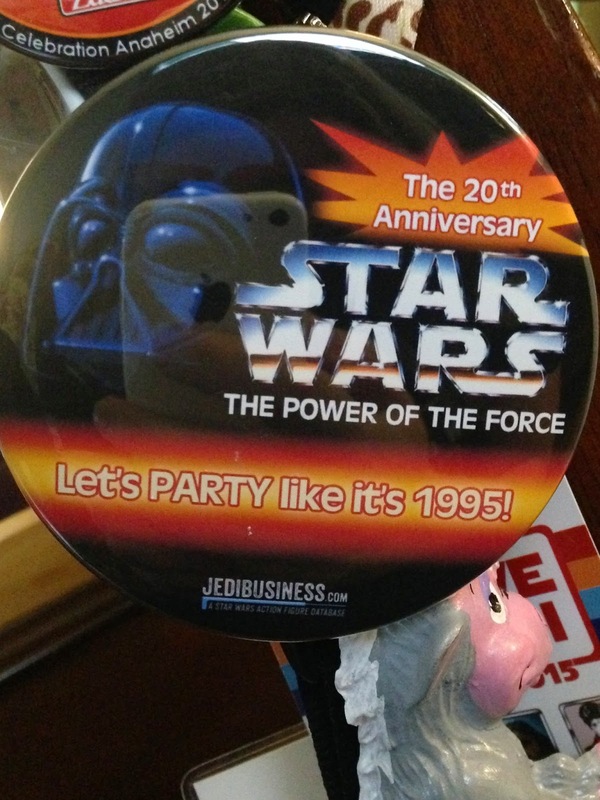 We're all still recovering from Celebration. Did you go? If not, what is wrong with you? 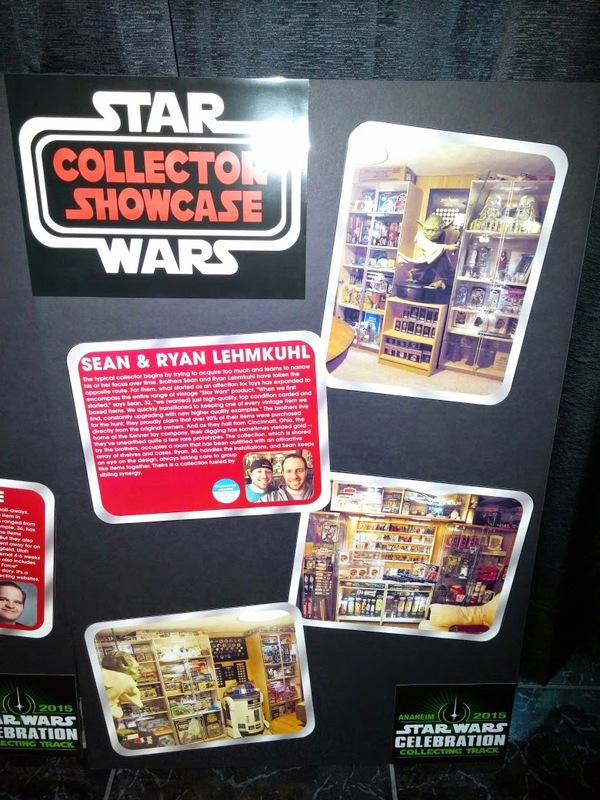 Among the cooler Celebration things I was involved in was something known as the Collector Showcase. It was devoted to display boards focused on various collectors, which were displayed along one wall of the secondary Collecting Track room. I thought it'd make sense to share the boards on the blog for the benefit of the hosers who didn't make the show. I worked on this project with Todd Chamberlain and Jarrod Clark. Jarrod did all the design work on the boards themselves. He did a great job (as usual). Tom Berges is 44, but his collecting is inseparable from his experiences as a seven-year-old. 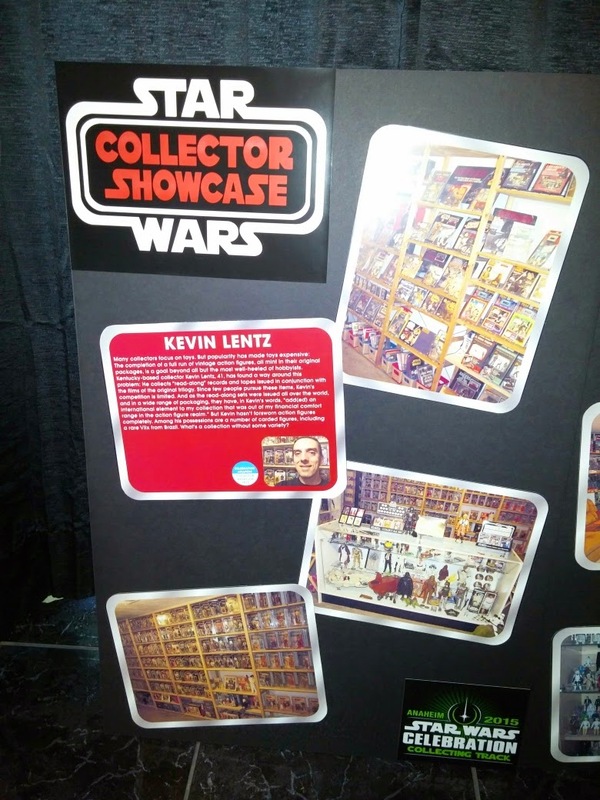 He collects early Kenner items and replica props, most of them connected with "A New Hope," the first of the Star Wars films to be released in theaters. 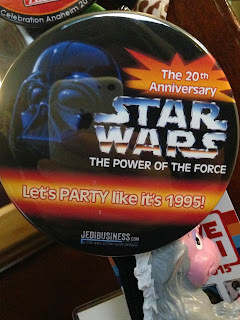 He even maintains a website devoted to nostalgia at www.igrewupstarwars.com. Though his collection is varied, he strives for cleanliness and simplicity in its display. This lends it a visual uniformity that makes his chosen display space -- the stairwell of his home in Olympia, Washington -- feel like a miniature museum of Star Wars. "The hobby," says Tom, "has taken me many places." Lately it's taken him into the realm of custom R2-D2 building. He might need a bigger stairwell. 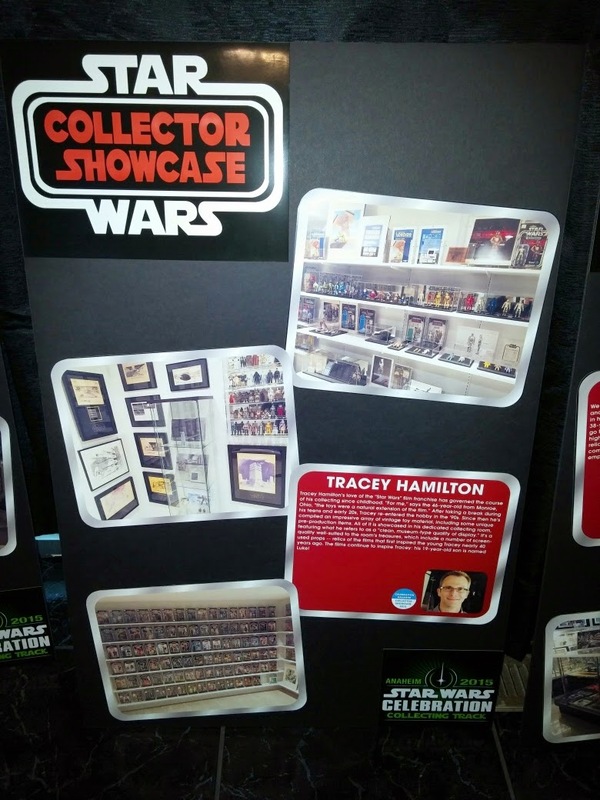 Tracey Hamilton's love of the Star Wars film franchise has governed the course of his collecting since childhood. "For me," says the 46-year-old from Monroe, Ohio, "the toys were a natural extension of the film." After taking a break during his teens and early 20s, Tracey re-entered the hobby in the '90s. Since then he's compiled an impressive array of vintage toy material, including some unique pre-production items. 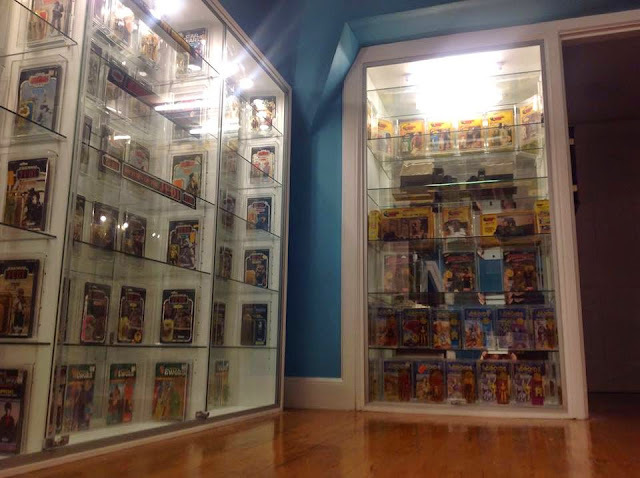 All of it is showcased in his dedicated collecting room, featuring what he refers to as a "clean, museum-type quality of display." 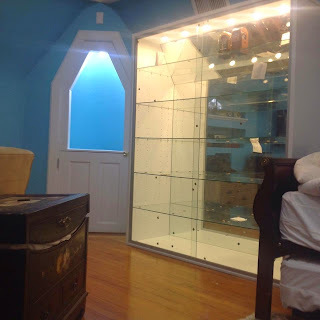 It's a quality well-suited to the room's treasures, which include a number of screen-used props -- relics of the films that first inspired the young Tracey nearly 40 years ago. The films continue to inspire Tracey: his 19-year-old son is named Luke! We often use the word "transparency" when talking of modernist architecture and politics. 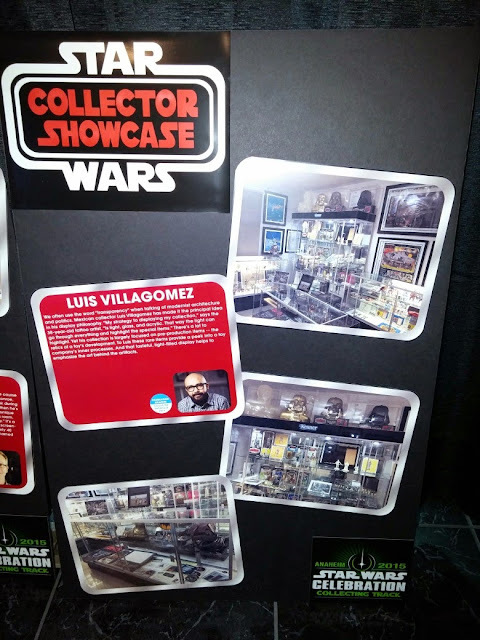 Mexican collector Luis Villagomez has made it the principal idea in his display philosophy. "My strategy to displaying my collection," says the 38-year-old tattoo artist, "is light, glass, and acrylic. That way the light can go through everything and highlight the special items." There's a lot to highlight. 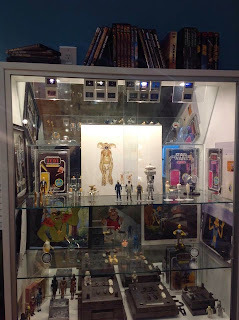 Yet his collection is largely focused on pre-production items -- the relics of a toy's development. To Luis these rare items provide a peek into a toy company's inner processes. And that tasteful, light-filled display helps to emphasize the art behind the artifacts. Usually a collection is tailored to the collector's personal space. Peter Fitzke is the rare collector who has tailored his personal space to his collection. 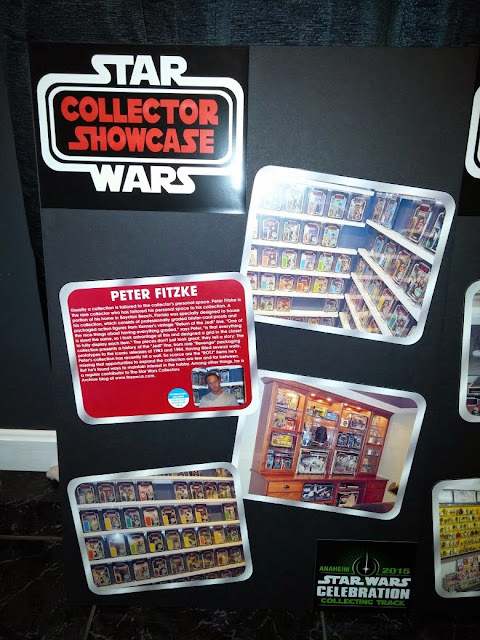 A portion of his home in Boynton Beach, Florida was specially designed to house his collection, which consists of professionally graded blister-card proofs and packaged action figures from Kenner's vintage Return of the Jedi line. 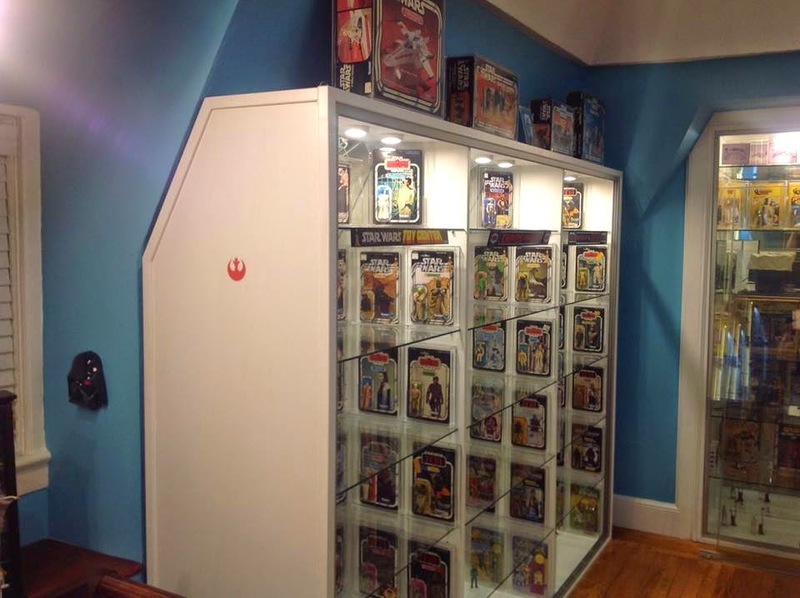 "One of the nice things about having everything graded," says Peter, "is that everything is sized the same, so I took advantage of this and designed a grid in the closet to fully display each item." 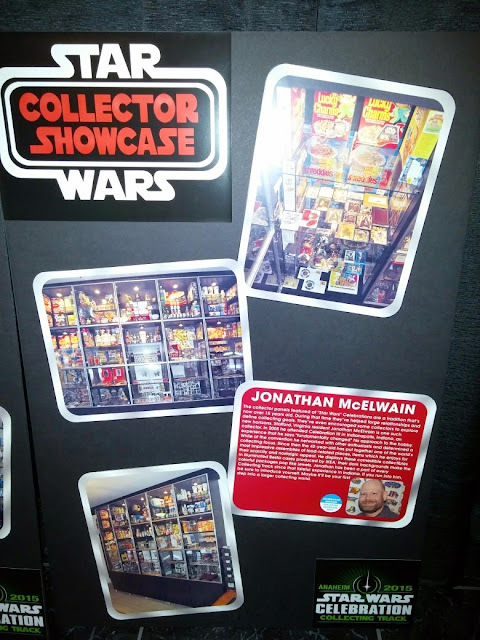 The pieces don't just look great; they tell a story: The collection presents a history of the Jedi line, from rare Revenge packaging prototypes to the iconic releases of 1983 and 1984. 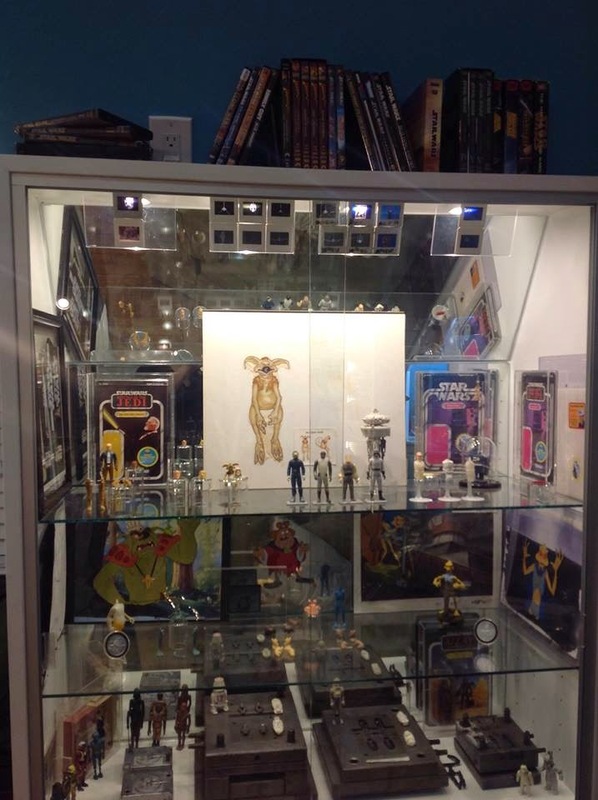 Having filled several walls, Peter's collection has recently hit a wall. So scarce are the "ROTJ" items he's missing that opportunities to expand the collection are few and far between. But he's found ways to maintain interest in the hobby. 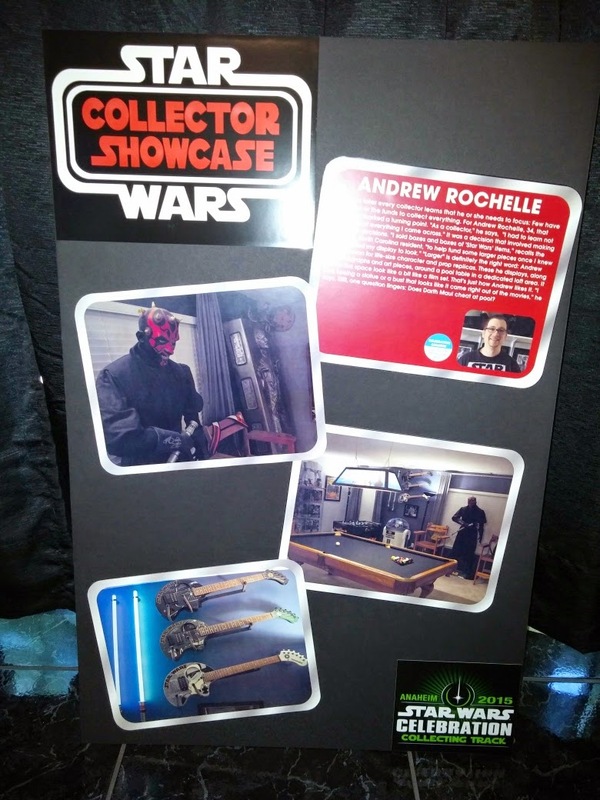 Among other things, he is a regular contributor to The Star Wars Collectors Archive blog at www.theswca.com. If you collected "Star Wars" toys as a child, you remember the mail-aways. Periodically, principal toy licensee Kenner offered an exclusive item in exchange for a bounty of proof-of-purchase seals. 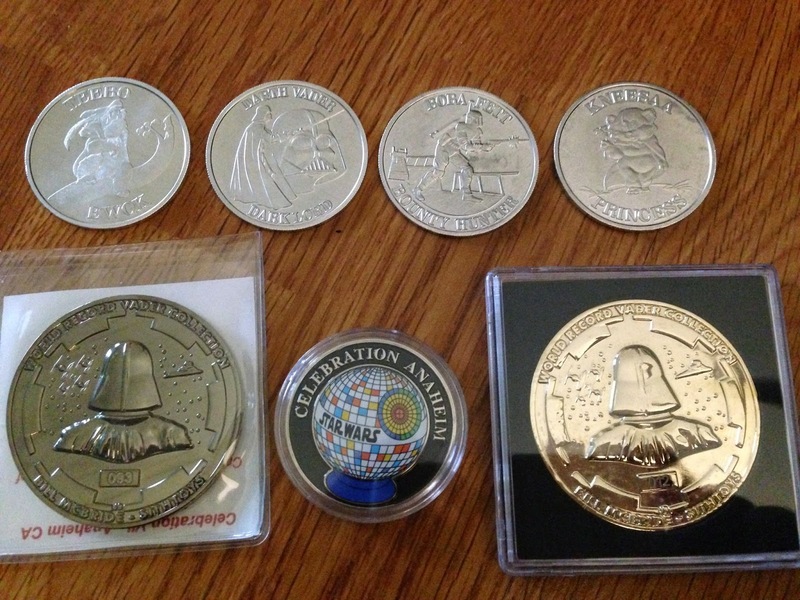 The rewards ranged from action figures to aluminum collector coins. 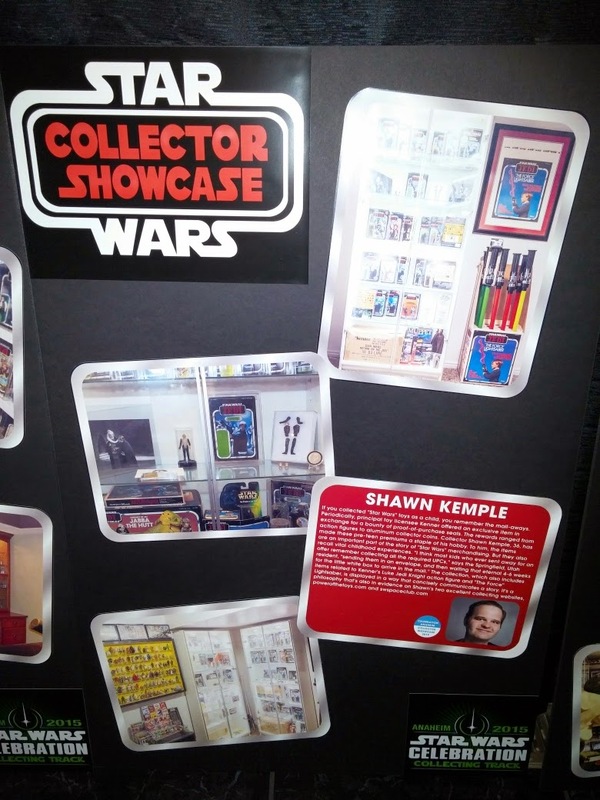 Collector Shawn Kemple, 36, has made these pre-teen premiums a staple of his hobby. 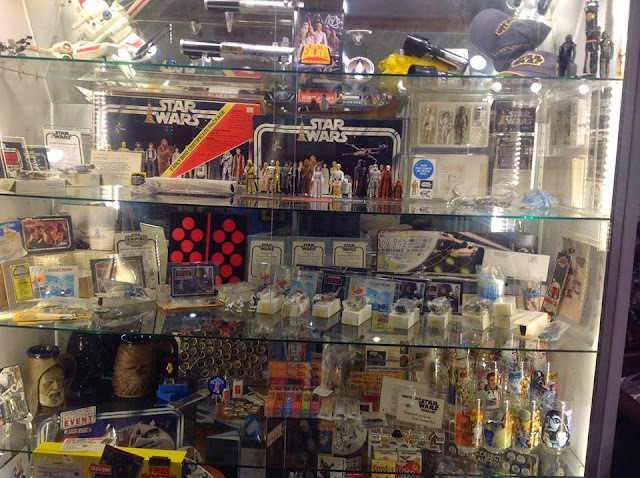 To him, the items are an important part of the story of Star Wars merchandising. But they also recall vital childhood experiences. "I think most kids who ever sent away for an offer remember collecting all the required UPCs," says the Springfield, Utah resident, "sending them in an envelope, and then waiting that eternal 4-6 weeks for the little white box to arrive in the mail." 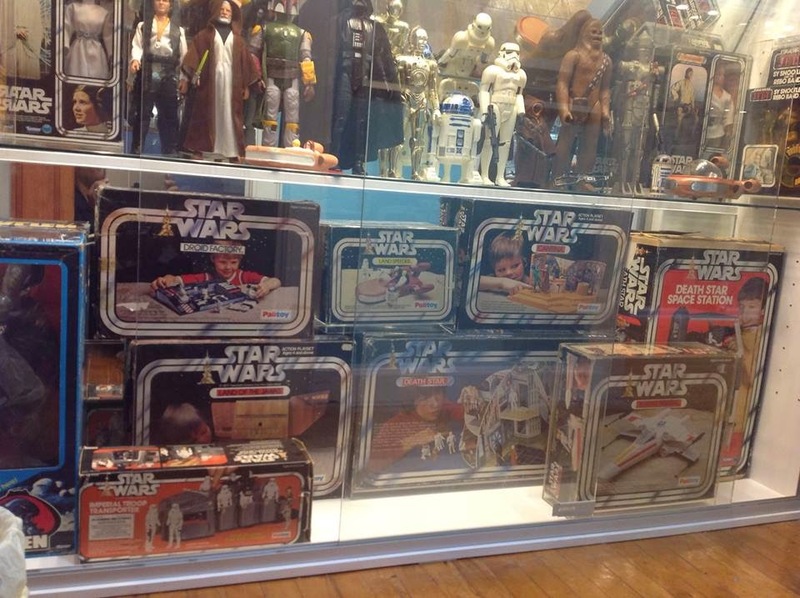 The collection, which also includes items related to Kenner's Luke Jedi Knight action figure and "The Force" Lightsaber, is displayed in a way that concisely communicates a story. It's a philosophy that's also in evidence on Shawn's two excellent collecting websites, powerofthetoys.com and swspaceclub.com. The typical collector begins by trying to acquire too much and learns to narrow his or her focus over time. Brothers Sean and Ryan Lehmkuhl have taken the opposite route. 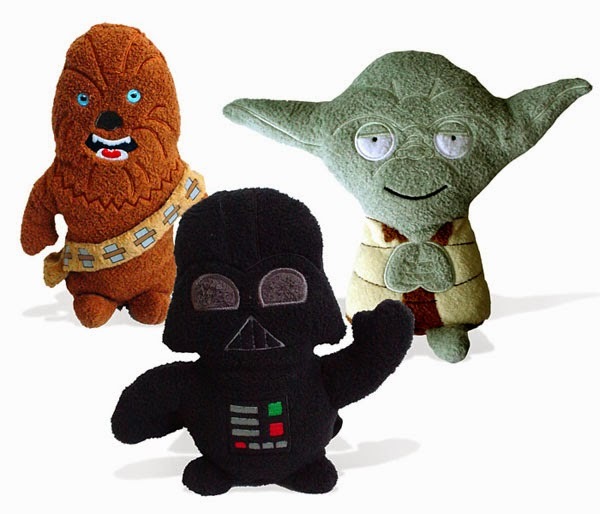 For them, what started as an affection for toys has expanded to encompass the entire range of vintage Star Wars product. "When we first started," says Sean, 32, "we [wanted] just high-quality, top condition carded and boxed items. We quickly transitioned to keeping one of every vintage item we find, constantly upgrading with new higher quality examples." The brothers live for the hunt; they proudly claim that over 90% of their items were purchased directly from the original owners. And as they hail from Cincinnati, Ohio, the home of the Kenner toy company, their digging has sometimes yielded gold -- they've unearthed quite a few rare prototypes. The collection, which is shared by the brothers, occupies a room that has been outfitted with an attractive array of shelves and cases. Ryan, 30, handles the installations, and Sean keeps an eye on the design, always taking care to group like items together. Theirs is a collection fueled by sibling synergy. Many collectors focus on toys. But popularity has made toys expensive: The completion of a full run of vintage action figures, all mint in their original packages, is a goal beyond all but the most well-heeled of hobbyists. 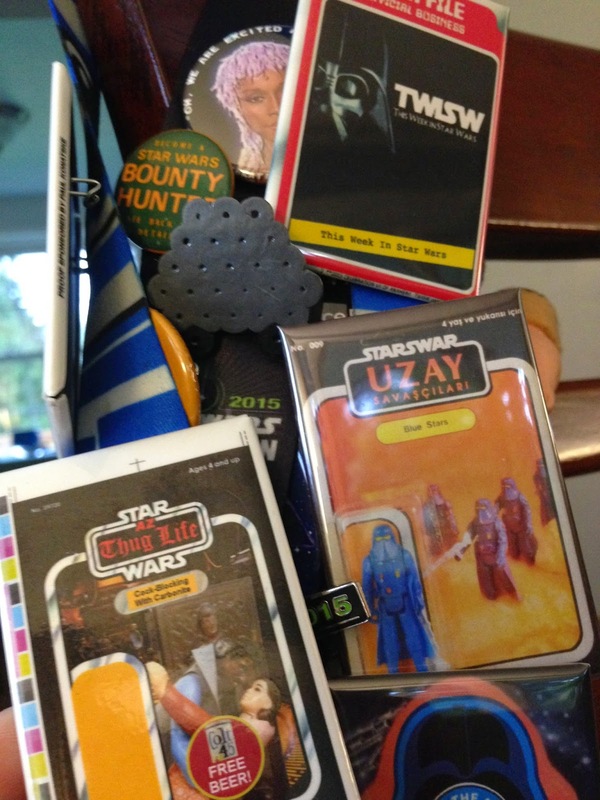 Kentucky-based collector Kevin Lentz, 41, has found a way around this problem: He collects "read-along" records and tapes issued in conjunction with the films of the original trilogy. Since few people pursue these items, Kevin's competition is limited. And as the read-along sets were issued all over the world, and in a wide range of packaging, they have, in Kevin's words, "add(ed) an international element to my collection that was out of my financial comfort range in the action figure realm." But Kevin hasn't forsworn action figures completely. Among his possessions are a number of carded figures, including a rare Vlix from Brazil. What's a collection without some variety? 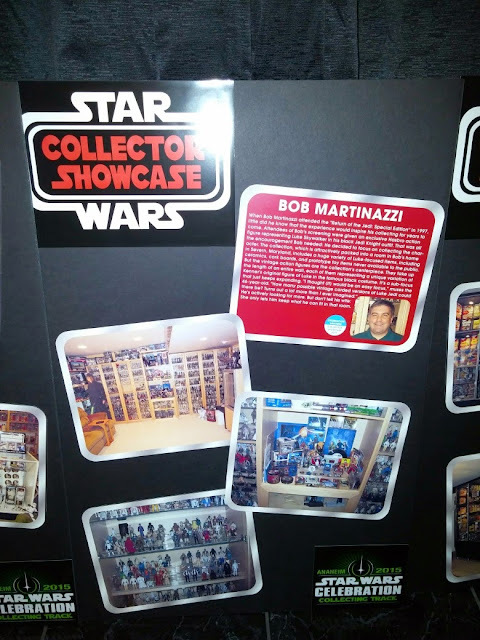 When Bob Martinazzi attended the Return of the Jedi: Special Edition in 1997, little did he know that the experience would inspire his collecting for years to come. Attendees of Bob's screening were given an exclusive Hasbro action figure representing Luke Skywalker in his black Jedi Knight outfit. That was all the encouragement Bob needed: He decided to focus on collecting the character. The collection, which is attractively packed into a room in Bob's home in Severn, Maryland, includes a huge variety of Luke-focused items, including ceramics, cork boards, and prototype toy items never available to the public. But the vintage action figures are the collection's centerpiece. 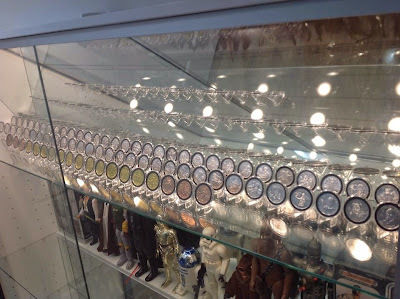 They take up the length of an entire wall, each of them representing a unique variation of Kenner's original figure of Luke in the famous black costume. It's a sub-focus that just keeps expanding. "I thought (it) would be an easy focus," muses the 46-year-old. "How many possible vintage carded versions of Luke Jedi could there be? Turns out a lot more than I ever imagined." He's actively looking for more. But don't tell his wife: She only lets him keep what he can fit in that room. The collector panels featured at Star Wars Celebrations are a tradition that's now over 15 years old. During that time they've helped forge relationships and define collecting goals. They've even encouraged some collectors to explore new horizons. Stafford, Virginia resident Jonathan McElwain is one such collector. In 2005 he attended Celebration III in Indianapolis, Indiana, an experience that he says "fundamentally changed" his approach to the hobby. While at the convention he networked with other enthusiasts and determined a collecting focus. Since then the 42-year-old has put together one of the world's most impressive assemblies of food-related pieces, items which he enjoys for their scarcity and nostalgic appeal. He displays these comestible collectibles in illuminated Besta cases produced by IKEA; their dark backgrounds make the colorful packages pop like jewels. 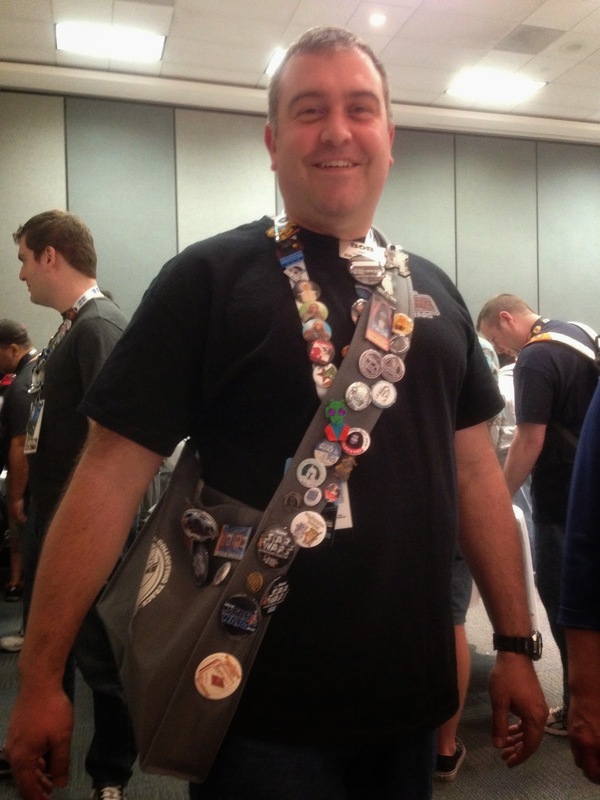 Jonathan has been a part of every Collecting Track since that fateful experience in Indiana. If you run into him, be sure to introduce yourself. Maybe it'll be your first step into a larger collecting world. 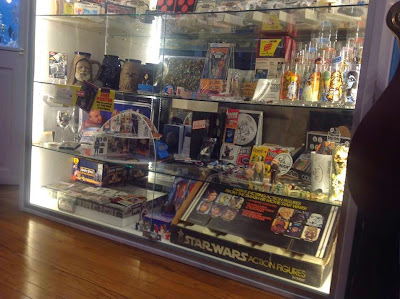 Sooner or later every collector learns that he or she needs to focus: Few have the space or the funds to collect everything. For Andrew Rochelle, 34, that realization marked a turning point. 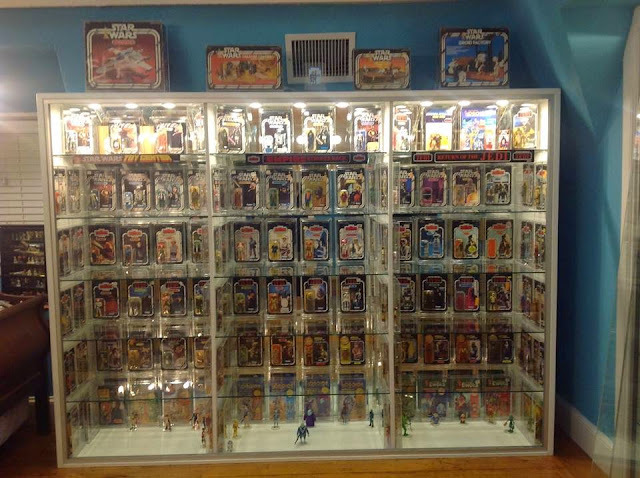 "As a collector," he says, "I had to learn not to just collect everything I came across." It was a decision that involved making some hard decisions. "I sold boxes and boxes of Star Wars items," recalls the Huntsville, North Carolina resident, "to help fund some larger pieces once I knew how I wanted my display to look." 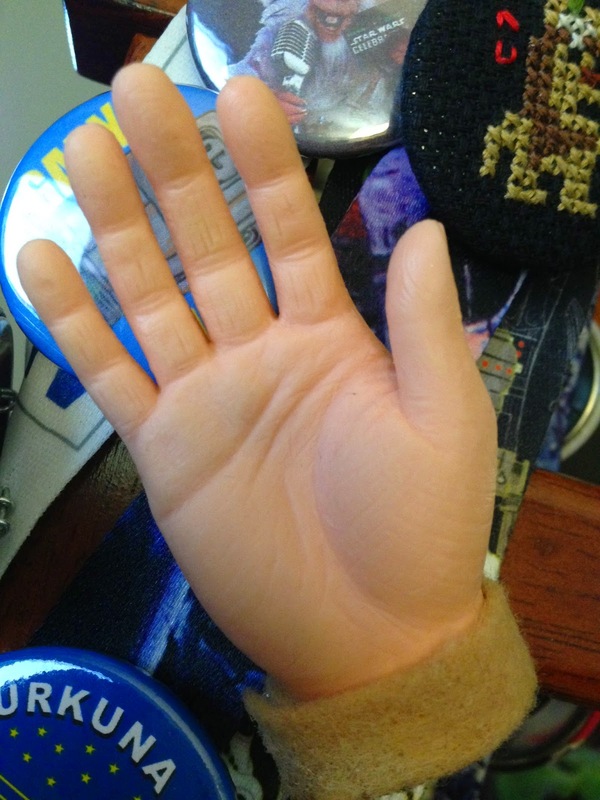 "Larger" is definitely the right word: Andrew has a passion for life-size character and prop replicas. These he displays, along with autographs and art pieces, around a pool table in a dedicated loft area. It makes the space look like a bit like a film set. That's just how Andrew likes it. "I love seeing a statue or a bust that looks like it came right out of the movies," he says. Still, one question lingers: Does Darth Maul cheat at pool?